Last week, Fatah and Hamas reached a unity agreement. The deal between the Islamist regime in Gaza and the Palestinian Authority governing the West Bank calls for a unity government to be formed within five weeks and for presidential, parliamentary and provincial elections to be called within six months of the coalition taking form. The sides will also exchange prisoners as part of the deal. As a result of the agreement between Fatah and Hamas, a listed terror entity, US Secretary of State John Kerry put his nine-month quest for an Israeli-Palestinian peace accord on indefinite hold. The Israel government, for its part, has said it will not resume the talks with Abbas if the Fatah-Hamas pact is implemented, unless Hamas accepts the international Quartet’s three conditions for engagement: recognizing Israel, stopping terrorism and accepting previous Israeli-Palestinian agreements. This is not the first reconciliation attempt between the rival Hamas and Fatah factions. Reconciliation deals were previously announced amid fanfare in Mecca in 2007, Cairo in 2011 and Doha in 2012, but were never implemented. Hamas and Fatah have been at loggerheads since Hamas’ seizure of Gaza in a 2007 coup. A unity Palestinian government is desirable in principle however the composition of this unity government does not bode well for peace. The Hamas regime is an Iranian proxy listed as a terrorist organization by Israel, the U.S., UK, the European Union, Australia and Japan. Indeed, for Hamas Prime Minister Ismael Haniyeh, arch terrorist Osama Bin Laden was a “Muslim freedom fighter”. While Mahmoud Abbas has said that a unity government between Fatah and Hamas would renounce violence and recognize the state of Israel thus fulfilling Quartet conditions, this appears not to be the case, with an influential Hamas voice stating Tuesday that Abbas is not telling the truth. “Hamas is committed to holy war against Israel”, it’s leader Khaled Mashaal affirmed on Wednesday. “Our path is resistance and the rifle and our choice is jihad”. Senior Hamas leader in the West Bank, Hassan Youssef, ruled out any recognition of Israel by the new Palestinian unity government. 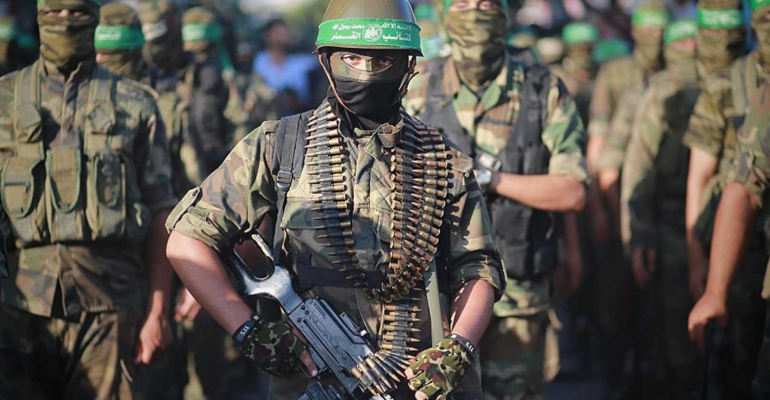 Hamas officials such as Raf’at Murra assert that “resisitance remains the right option”. Indeed, in addition to Abbas’ demand to release Palestinian terrorists held in Israeli jails, the inevitable integration of Fatah and Hamas security apparatuses and the respective exchange of Hamas and Fatah terrorists pose a serious security risk for Israel. While Hamas is known for its Islamist views, Mahmood Abbas is designated a moderate by many in the mainstream media. Yet, his embrace of terrorists and the Hamas terrorist entity is not new. Despite his status as a moderate, Abbas leads Palestinians in revering terrorists who have attacked Israeli civilians, provides generous economic and social compensation to terrorists and their families with the payment of salaries that exceeds those of his security forces, and paid for by international aid funds. Indeed, the well-documented history of Palestinian leaders speaking differently for a Western audience in English than for a Arab one in Arabic has misled both Palestinians and many in the West. This has left Palestinian society unprepared to meet Israeli and Western expectations for peace. Mahmood Abbas knows that years of stoking the dream of the right of return fueled with incitement and the glorification of terrorism means Palestinians are not ready to be be sold on an end of claims agreement nor an agreement which does not include the right to inundate the Jewish state with 5 million Palestinian “refugees”. Having replaced all of Israel with a Palestinian flag (see the Fatah logo), Abbas cannot deliver less than this. Settlements were not an obstacle to Israel’s unilateral withdrawal and removal of 10,000 Jews from Gaza. They were not an obstacle in withdrawing from Sinai and making peace with Egypt and they are today not an obstacle in making peace with the Palestinians. Rather, the consistent rejection by successive Palestinian leaders of comprehensive offers made by Israeli leaders from all sides of the political spectrum—Labour, Likud, Kadima—demonstrates a continued desire on the part of the Palestinian leadership to deliver on Palestinian promises of replacing Israel with Palestine. Therein lies the obstacle to peace.